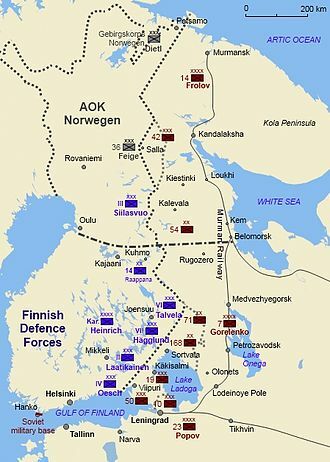 In June 1941, with the start of the German invasion of the Soviet Union, the Finnish Defence Forces launched their offensive following Soviet airstrikes. By September 1941, Finland occupied East Karelia and reversed its post–Winter War concessions to the Soviet Union along the Karelian Isthmus and in Ladoga Karelia. The Finnish Army halted its offensive past the old border, around 30–32 km (19–20 mi) from the centre of Leningrad and participated in besieging the city by cutting its northern supply routes and digging in until 1944. [Note 8] In Lapland, joint German–Finnish forces failed to capture Murmansk or cut the Kirov (Murmansk) Railway, a transit route for lend-lease equipment to the USSR. 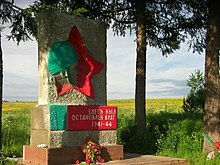 The conflict stabilised with only minor skirmishes until the tide of the war turned against the Germans and the Soviet Union's strategic Vyborg–Petrozavodsk Offensive in June 1944. The attack drove the Finns from most of the territories they had gained during the war, but the Finnish Army halted the offensive in August 1944. 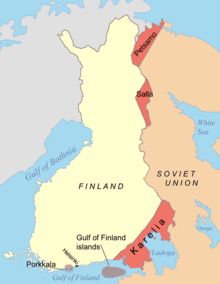 In October 1939, the Soviet Union attempted to negotiate with Finland to cede Finnish territory on the Karelian Isthmus and the islands of the Gulf of Finland, and to establish a Soviet military base near the Finnish capital of Helsinki. 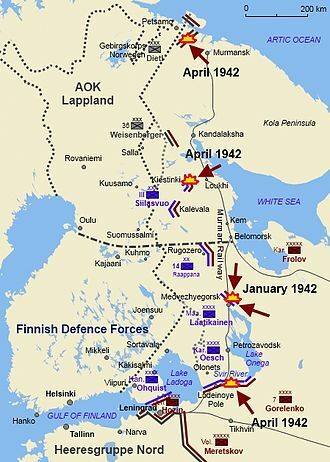 The Finnish government refused, and the Red Army invaded Finland on 30 November 1939. The USSR was expelled from the League of Nations and was condemned by the international community for the illegal attack. Foreign support for Finland was promised, but very little actual help materialised, except from Sweden. The Moscow Peace Treaty concluded the 105-day Winter War on 13 March 1940 and started the Interim Peace. 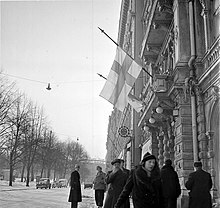 By the terms of the treaty, Finland ceded 11 percent of its national territory and 13 percent of its economic capacity to the Soviet Union. Some 420,000 evacuees were resettled from the ceded territories. 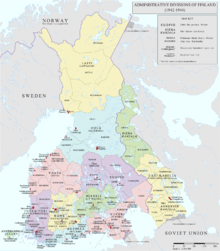 Finland avoided total conquest of the country by the Soviet Union and retained its sovereignty. On 31 July 1940, German Chancellor Adolf Hitler gave the order to plan an assault on the Soviet Union, meaning Germany had to reassess its position regarding both Finland and Romania. Until then, Germany had rejected Finnish appeals to purchase arms, but with the prospect of an invasion of Russia, this policy was reversed, and in August the secret sale of weapons to Finland was permitted. Military authorities signed an agreement on 12 September, and an official exchange of diplomatic notes was sent on 22 September. At the same time, German troops were allowed to transit through Sweden and Finland. 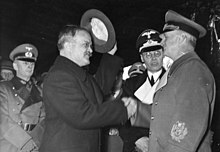 This change in policy meant Germany had effectively redrawn the border of the German and Soviet spheres of influence, violating the Molotov-Ribbentrop Pact. Finland never signed the Tripartite Pact, which had been signed by all de jure Axis powers. 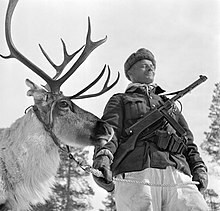 The Finnish leadership and Mannerheim, in particular, clearly stated they would fight against the Soviets only to the extent necessary to redress the balance of the 1940 treaty. For Hitler, the distinction was irrelevant, as he saw Finland as an ally. 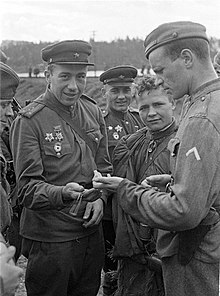 The Northern Front (Russian: Северный фронт) of the Leningrad Military District was commanded by Lieutenant General Markian Popov and numbered around 450,000 soldiers in 18 divisions and 40 independent battalions in the Finnish region. During the Interim Peace, the Soviet Military had relaid operational plans to conquer Finland, but with Operation Barbarossa, the USSR required its best units and latest materiel to be deployed against the Germans, and thus abandoned plans for a renewed offensive against Finland. The 23rd Army was deployed in the Karelian Isthmus, the 7th Army to Ladoga Karelia and the 14th Army to the Murmansk–Salla area of Lapland. The Northern Front also commanded eight aviation divisions. As the initial German strike against the Soviet Air Forces had not affected air units located near Finland, it could deploy around 700 aircraft supported by a number of Soviet Navy wings. The Red Banner Baltic Fleet comprised 2 battleships, 2 light cruisers, 47 destroyers or large torpedo boats, 75 submarines, over 200 smaller craft as well as hundreds of aircraft—and outnumbered the Kriegsmarine. In the evening of 21 June 1941, German mine-layers hiding in the Archipelago Sea deployed two large minefields across the Gulf of Finland. Later that night, German bombers flew along the gulf to Leningrad, mining the harbour and the river Neva, making a refueling stop at Utti, Finland, on the return leg. In the early hours of 22 June, Finnish forces launched Operation Kilpapurjehdus ("Regatta"), deploying troops in the demilitarised Åland Islands. Although the 1921 Åland convention had clauses allowing Finland to defend the islands in the event of an attack, the coordination of this operation with the German invasion and the arrest of the Soviet consulate staff stationed on the islands, meant that the deployment was a deliberate violation of the treaty, according to Finnish historian Mauno Jokipii. Following the launch of Operation Barbarossa at around 3:15 a.m. on 22 June 1941, the Soviet Union sent seven bombers on a retaliatory airstrike into Finland, hitting targets at 6:06 a.m. Helsinki time as reported by the Finnish coastal defence ship Väinämöinen. On the morning of 25 June, the Soviet Union launched another air offensive, with 460 fighters and bombers targeting 19 airfields in Finland, however inaccurate intelligence and poor bombing accuracy resulted in several raids hitting Finnish cities, or municipalities, causing considerable damage. 23 Soviet bombers were lost in this strike while the Finnish forces lost no aircraft. Although the USSR claimed that the airstrikes were directed against German targets, particularly airfields, in Finland, the Finnish government used the attacks as justification for the approval of a "defensive war". According to historian David Kirby, the message was intended more for public opinion in Finland than abroad, where the country was viewed as an ally of the Axis powers. The crucial arctic lend-lease convoys from the US and the UK via Murmansk and Kirov Railway to the bulk of the Soviet forces continued throughout World War II. The US supplied almost $11 billion in materials: 400,000 jeeps and trucks; 12,000 armored vehicles (including 7,000 tanks, which could equip some 20 US armoured divisions); 11,400 aircraft; and 1.59 million t (1.75 million short tons) of food. As a similar example, British shipments of Matilda, Valentine and Tetrarch tanks accounted for only 6 percent of total Soviet tank production, but over 25 percent of medium and heavy tanks produced for the Red Army. By the autumn of 1941, the Finnish military leadership started to doubt Germany's capability to finish the war quickly. The Finnish Defence Forces suffered relatively severe losses during their advance, and, overall, German victory became uncertain as German troops were halted near Moscow. German troops in northern Finland faced circumstances they were unprepared for and failed to reach their targets. As the front lines stabilised, Finland attempted to start peace negotiations with the USSR. Mannerheim refused to assault Leningrad and inextricably tie Finland to Germany, regarding his objectives for the war to be achieved, a decision which angered the Germans. Finland had a small Jewish population of approximately 2,300 people, of whom 300 were refugees. They had full civil rights and fought with other Finns in the ranks of the Finnish Army. The field synagogue in East Karelia was one of the very few functioning synagogues on the Axis side during the war. There were several cases of Jewish officers of the Finnish Army being awarded the German Iron Cross, which they declined. German soldiers were treated by Jewish medical officers—who sometimes saved the soldiers' lives. German command mentioned Finnish Jews at the Wannsee Conference in January 1942, wishing to transport them to the Majdanek concentration camp in occupied Poland. SS leader Heinrich Himmler also raised the topic of Finnish Jews during his visit in Finland in the summer of 1942; Finnish Prime Minister Jukka Rangell replied that Finland did not have a Jewish question. In November 1942, the Minister of Interior Toivo Horelli and the head of State Police Arno Anthoni secretly deported eight Jewish refugees to the Gestapo, raising protests among Finnish Social Democrat Party ministers. Only one of the deportees survived. After the incident, the Finnish government refused to transfer any more Jews to German detainment. Many civilians who had been displaced after the Winter War had moved back into Karelia during the Continuation War and now had to be evacuated from Karelia again. Of the 260,000 civilians who had returned Karelia, only 19 chose to remain and become Soviet citizens. 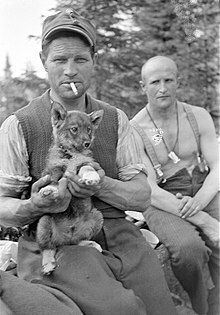 Most of the Ingrian Finns, together with Votes and Izhorians living in German-occupied Ingria, had been evacuated to Finland in 1943–1944. After the armistice, Finland was forced to return the evacuees. Soviet authorities did not allow the 55,733 returnees to resettle in Ingria and instead deported the Ingrian Finns to central regions of the USSR. The war is considered a Soviet victory. 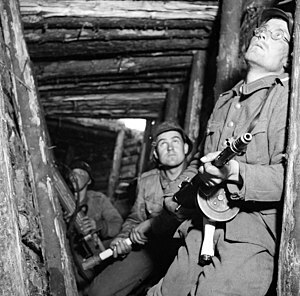 According to Finnish historians, Soviet casualties in the Continuation War were not accurately recorded and various approximations have arisen. Russian historian Grigori Krivosheev estimated in 1997 that around 250,000 were killed or missing in action while 575,000 were medical casualties (385,000 wounded and 190,000 sick). Finnish author Nenye and others stated in 2016 that at least 305,000 were confirmed dead, or missing, according to the latest research and the number of wounded certainly exceeded 500,000. The number of Soviet prisoners of war in Finland was estimated by Finnish historians to be around 64,000, 56,000 of whom were captured in 1941. Around 2,600 to 2,800 Soviet prisoners of war were rendered to Germany in exchange for roughly 2,200 Finnic prisoners of war. Of the Soviet prisoners, at least 18,318 were documented to have died in Finnish prisoner of war camps. The extent of Finland's participation in the Siege of Leningrad, and whether Soviet civilian casualties during the siege should be attributed to the Continuation War, is debated and lacks a consensus (estimates of civilian deaths during the siege range from 632,253 to 1,042,000). 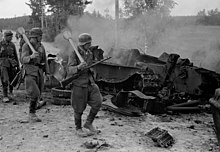 Of material losses, authors Jowett and Snodgrass state that 697 Soviet tanks were destroyed and Finnish war historian Matti Koskimaa calculated that the Soviet Union suffered 55 tanks captured, 673 trucks captured, 306 artillery pieces captured, 300 tractors captured and 303 aircraft destroyed. ^ a b Malmi, Timo (2005). "Jatkosodan suomalaiset sotavangit". In Leskinen, Jari; Juutilainen, Antti (eds.). Jatkosodan pikkujättiläinen (in Finnish) (1st ed.). Werner Söderström Osakeyhtiö. pp. 1022–1032. ISBN 9510286907. ^ "Scan from the coastal defence ship Väinämöinen's log book". Digital Archive of the National Archives of Finland. 22 June 1941. Retrieved 21 February 2018. ^ "War declared on Finland, Rumania, Hungary". The Examiner. C (232). Launceston. 8 December 1941. Retrieved 24 February 2018 – via National Library of Australia. ^ Peri, Alexis (2017). The War Within. Harvard University Press. p. 4. ISBN 9780674971554. Archived from the original on 25 February 2018. In August 1941, Hitler's Army Group North and his Finnish allies began to encircle Leningrad. They rapidly extended their territorial holdings first in the west and south and eventually in the north. By 29 August 1941, they had severed the last railway line that connected Leningrad to the rest of the USSR. 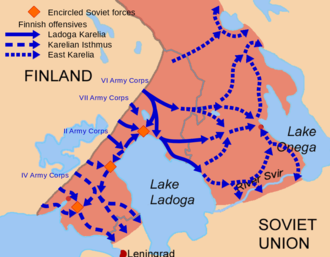 By early September, Leningrad was surrounded, save a heavily patrolled water passage over Lake Ladoga. ^ Vuonokari, Tuulikki (2003). 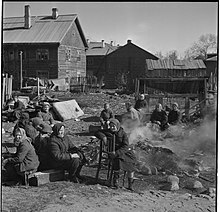 "Jews in Finland During the Second World War". Finnish Institutions Research Paper. University of Tampere. Archived from the original on 3 March 2016. ^ Petäjä, Jukka (14 October 2017). "Lauantaiessee: Miten on mahdollista, että natsi-Saksa palkitsi suomenjuutalaisia rautaristillä jatkosodassa?" [Saturday Essay: How is it possible that Nazi Germany awarded Finnish Jews with an Iron Cross during the Continuation War?]. Helsingin Sanomat (in Finnish). Retrieved 1 November 2018. ^ a b Kurenmaa, Pekka; Lentilä, Riitta (2005). "Sodan tappiot". In Leskinen, Jari; Juutilainen, Antti (eds.). Jatkosodan pikkujättiläinen (in Finnish). WSOY. pp. 1150–1162. ISBN 9510286907. ^ Provis, Peter (1999). "Finnish achievement in the Continuation War and after". Nordic Notes. Flinders University. 3. ISSN 1442-5165. Archived from the original on 3 November 2013. ^ Jakobson, Max (8 November 2003). "Wartime refugees made pawns in cruel diplomatic game" (in Finnish). Helsingin Sanomat. Archived from the original on 4 June 2011. National Defence University (Finland) (1994). Raunio, Ari (ed.). Jatkosodan historia 1–6 [History of the Continuation War 1–6] (in Finnish). WSOY. Taylor, Alan (23 May 2013). "Finland in World War II". The Atlantic.